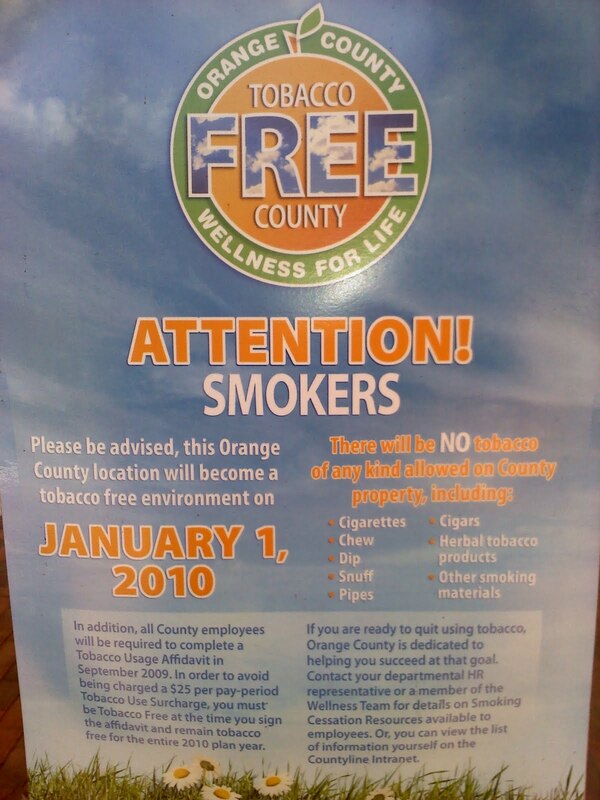 On August 4th, 2009 the Orange County Commissioners voted to require that all county employees sign a Tobacco Usage Affidavit stating that they are tobacco free or else they will be charged a $25 per pay period ($650 per year) tobacco use surcharge. However, employees are allowed to smoke up to 4 celebratory cigars per year and not be fined. The reason for this, according to Commissioners, was that the cost of health insurance for county employees that use tobacco is higher than non-tobacco users. While I believe this is to be true for cigarette smokers, there was no evidence that this is true for cigar-only smokers. In fact, according to the National Cancer Institute's Monograph 9, a 1-2 cigar per day smoker has the same overall mortality ratio as a non-smoker. 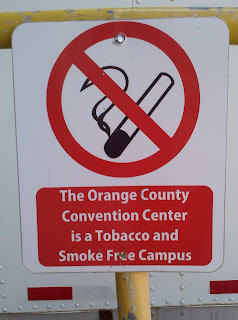 What makes Orange County's Tobacco Free policy even more bothersome is that it dictates what an employee can and can't do outside of work. If on his time off, an Orange County Sheriff, firefighter, maintenance worker, librarian, inspector, prison guard, park ranger or administration worker happens to stop by his local cigar shop or enjoy a cigar with his buddies more than four times a year, he can be fined and even reprimanded. Now, many people have asked "How is the government going to know if some one smokes more than four cigars a year?" The answer - they can't. But do we really want to live in a society where one fears that "Big Brother" may be watching or have to look out for an angry, anti-tobacco co-worker spying and ratting out fellow employees who enjoy an occasional cigar? I will say that of the three county commissioners that I have spoken with so far about this issue (Scott Boyd, Bill Segal & Linda Stewart), it seems that this "Tobacco Use" fine is purely about trying to plug a budget gap with Orange County's health insurance program. Now for the second and much bigger issue...In addition to fining employees who smoke cigars, Orange County Mayor Rich Crotty took this one step further and issued an Executive Order that bans the USE of tobacco products including but not limited to cigars, pipes, cigarettes, chew, dip, snuff, herbal tobacco products and other smoking materials on ALL county owned and leased property. The Mayor's office went as far as displaying posters that state that tobacco products are not even allowed on county owned property. This includes county owned parks, streets, sidewalks, boat ramps, fishing docks, parking garages, water treatment facilities, maintenance facilities, county buildings and the Orange County Convention Center. After contacting Mayor Crotty's office and asking how he could ban the possession of a legal tobacco product on county property, his Chief of Staff George Rodon stated "The poster was in error and has been removed. Possession of tobacco products is permitted. It is the USE that is prohibited." Unfortunately, not all these posters have been removed as several cigar smokers that live in Orange County have stated that they have seen these posters still on display at county parks and water treatment facilities as well as "Tobacco & Smoke Free Campus" signs at the Orange County Convention Center. I hardly think these posters were printed in error. Someone gave the directive to create, proof, print and hang these posters. I think the Mayor's Chief of Staff got his hand caught in our "freedom" cookie jar. When I asked the Mayor if his tobacco use ban on county property was just for employees or if this included the public as well? The Mayor's Chief of Staff replied "TO ALL". Florida already has a state wide indoor smoking ban and there is no scientific evidence that proves smoking or using tobacco products outdoors causes any harm to non-tobacco users. 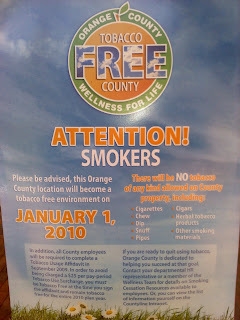 So why did Mayor Crotty go overboard and ban ALL tobacco use indoors and OUTDOORS on county property? I have yet to find out as the Mayor's office has refused to grant me a meeting or even discuss this issue over the phone. However it seems pretty fishy that shortly after the tobacco ban went into effect, the Orange County Health Department received a $6.6 million in federal "Stimulus Money" that will be used to make Orange County a national model for tobacco prevention & control, make public parks smoke free and to change product placement in local stores. And of course, this was all done without any public comment or input. So it sounds like Mayor Crotty, who is supposed to be a conservative Republican, sold out our freedom to enjoy a cigar (or any other form of tobacco) in the great outdoors for a special-interest stimulus check, compliments of the U.S. taxpayer. Just writing this makes me want to puke! But there is something YOU can do. If you don't agree with Mayor Crotty's draconian ban on tobacco, please send him an email. Remember, the city of Orlando and it's tourist attractions are all located in Orange County and input from tourists and business travelers is VERY important. We have also posted a Cigar Rights of America Action Alert that has the contact info for the Orange County Commissioners. Please encourage them to over-rule Mayor Crotty's Executive Order on tobacco. Remember...FREEDOM ISN'T FREE! So take the time and stand up for your right to enjoy a cigar!